Today’s video is about accessories. In a previous article,that I wrote, I talked about my favorite accessory –and that’s scarves. As a quad, it’s difficult to deal with a lot of different ear rings or necklaces so I just keep it simple with scarves. You might be wondering by now how many scarves I have, and honestly, I am afraid to count them up because it’s a little embarrassing. But what I will say is that most of my scarves come from other countries. To have friends that travel a lot or have co-workers that work overseasand either while I’m visiting or while they are traveling, they know what my love is. And so, already the ones I have tried on have come from numerous countries. This one came from Thailand. I have changed into another T-shirt that is another neutral color – to try on more scarves for you. This scarf, which is just beautiful –all I am going to do is just throw this around one time and just wear it like that. If it’s raining out –I might just throw a scarf over my head. And it’s pretty easily done. Throw the other end over my shoulder. It will keep my clothes dry. With shorts, some pants and a neutral cardigan, you add a scarf and have a completely different look. I hope that scarves become part of your wardrobe. It’s nice and easy and they’re warm. So, good luck and I hope this has helped. 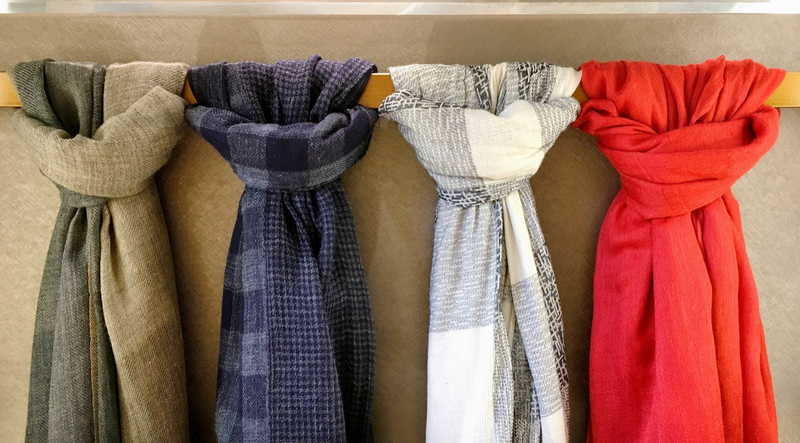 Here are a few tips to get you started on your very own scarves collection. Search for one that can be used as a formal piece. Scarves for a special occasions, that add a feeling of luxury to an everyday ensemble, might have gold or metallic accents, rhinestones, or a fun animal print. A cashmere or wool scarf is a must have! These materials are soft and cozy and can be the ultimate warm accessory. These scarves are perfect for cold winters, air conditioned rooms, and romantic evening strolls. This type of scarf will give even the dullest outfit the pop of color it deserves. The Statement Scarf is a wardrobe must-have because it can instantly punch up any basic attire. Now that you have the basics, your closet will be ready to accessorize for any occasion. A night out with the girls? Go glam! Sunday brunch with the family? The statement scarf is perfect. Maybe you and your honey have a stargazing date...grab the warmest scarf you have and snuggle up. Yes you can still be a girly girl. Have fun with it.